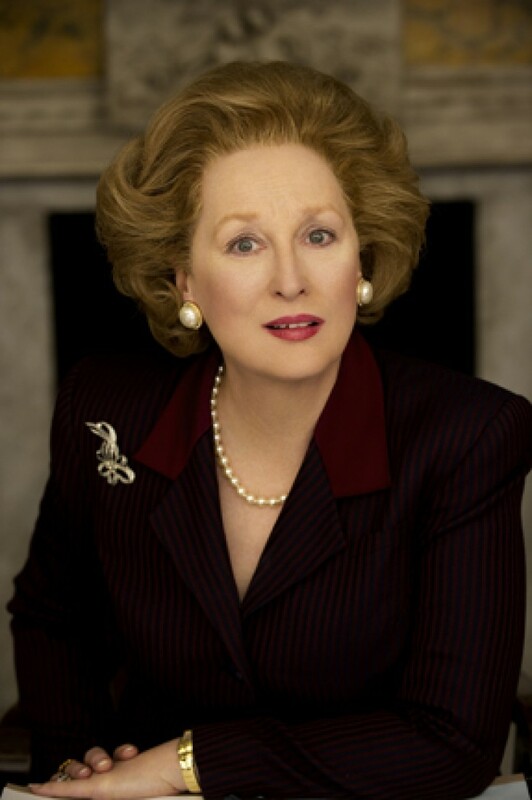 NEW YORK—In “The Iron Lady,” Meryl Streep stars as British Prime Minister Margaret Thatcher, one of that nation’s most controversial conservative leaders of the 20th century. Streep recently discussed her role in that film, and how she transformed into the famous world leader. Front Row Features: I understand you spent four hours or five hours a day with the makeup for Margaret Thatcher. Meryl Streep: We got it down to under two. Front Row Features: Did you worry that the makeup would obscure your performance, or conversely be the performance? Streep: Interestingly, in the process of developing the older Margaret we ended up taking away. There were certain elements that the genius prosthetics designer, Mark Coulier, was able to achieve. He created something that was tissue-thin so that I felt very free and I felt like I was looking at a member of my family, if not me, and so it actually made acting easier. Front Row Features: How did your background in theater enhance your experience in this film? Streep: I think for me to imagine myself in different ways comes from my beginnings in the theater. People are more accepting of when you go apparently wildly afield from who you are or where you were brought up. Otherwise, I would always play people from New Jersey, which limits the career. So yes, I felt like I had freedom to try to step into these very small, tight, big shoes. Front Row Features: Could you tell me how did you relate to Margaret Thatcher as a mother? Streep: Well, I got in inkling. I have an inkling of the size of the day that she fulfilled. I looked at her daily calendar and I tried to imagine that. I’m a mother and I work in spurts throughout my career, so I’d work for four or five months and then not, so I was home a lot. And I tried to imagine 11-1/2 years of this kind of, you know, she was unhappy if there were 10 minutes of free time anywhere in her day that was wasted time. And so I imagined trying to be in the lives of your children to the degree that I try to be in their lives, and I think it would have been very difficult. Front Row Features: Obviously, you didn’t interact with your younger counterpart (Welsh actress Alexandra Roach) on screen, but did you have interaction behind the scenes in talking about the character and how she evolved? Streep: For me just to see Harry (Lloyd, who played the younger Denis Thatcher) and Alex on that same day dancing through the dining room where Jim (Broadbent, who plays the older Denis Thatcher) and I were dancing before, I was completely overcome. I just broke down because it was like seeing actually your life flash before your eyes. It did anchor something emotionally in me that was very important. And then of course when I saw the movie, I completely fell in love with Harry Lloyd and could see why she did. Front Row Features: What kind of research did you do for this role? Streep: I did observe lots of newsreel footage of her, and the biggest challenge for me was just accomplishing the long lines of thought that she would launch into without taking a breath. It was masterful the way she could manage these interviews. I’m taking notes on that. Front Row Features: How do you choose a character like Thatcher, who’s still alive and might be able to see it? Have you ever met her? Streep: I did not meet her but I did see her once at my daughter’s university, at Northwestern. We went to see her lecture and that made an indelible impression on me, in about 2001 or 2002. I can’t remember. But the question as to the special responsibility to playing someone who lives and potentially could see this, we have come under criticism for portraying someone who is frail and in delicate health. Some people have said it’s shameful to portray this part of a life, but the corollary thought to that is if you think that debility, delicacy, dementia is shameful, if you think that the ebbing end of life is something that should be shut away, if you think that people need to be defended from those images, then yes, if you think then it’s a shameful thing. But I don’t think that. I have had experience with people with dementia. I understand it. And I think it’s natural. Front Row Features: What it was like working together again with director Phyllida Lloyd after “Mamma Mia!” and have you developed a shorthand with her? Streep: I loved working with her the first time. But yes, we had a shorthand. We had to because we had $14 million to shoot a movie that takes place over the course of six decades. That’s basically no money. That’s less than 1/10 of what “Hugo” cost. You can’t spend time missing cues. We did discuss things on the run and all of us understood through a process of a year before we began shooting what we were wanting from this piece. That it was going to be not a docudrama, not a chronicling of Margaret Thatcher’s political life, that it would be a very particular look back through her own eyes at selected memories. Not in chronological order, in a jumble of memory, we grant glory days that it would all be a part of a reckoning at the end. So we had many discussions before we got onto the game field, and then once we got on we just went. Front Row Features: Do you prefer playing real people or fictional characters where you can have more interpretation of that fictional character? Streep: Since a good 40 percent of the film I’m playing a Margaret Thatcher no one has seen or knows and we can’t know, it’s an imagined journey that we were taking. So I felt a lot of freedom. I felt completely free, and that’s a testament to the director and the strength of that vision that we were taking three days in the life of an old lady and using the turbulence of those days, the moving out of her husband’s things, as a trigger to a lot of memories, and disorientation, and a feeling of being thrust back and forth between the past and the present.